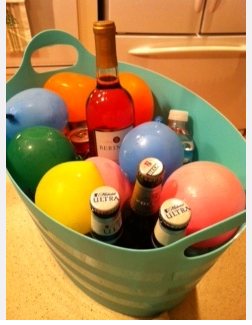 Here's a colorful way to keep drinks cold during a party. Just freeze balloons filled with water. (Actual water balloons are not recommended, as they are not as strong) Keep some in the freezer, so when the ones in your cooler start to melt, you can quickly replace them. No worry about having enough ice on hand. And it certainly helps to make even your bucket of drinks look festive! Found via a friend's Pinterest board here. Sourced as princessbubble.com--but I could not find the image anywhere on the site! Great idea! I just pinned it! only problem here is - How do you make them? Pour water into the balloon before blowing up? Hmmm....would love to learn HOW. . .
@Anonymous: They are water balloons. So you can just wrap the lip of the balloon around your faucet and fill the balloons. Then freeze them. Sorry, Correction - Sharing your idea on my Facebook page, The Inspired Table. I will give out your blog address. This is a great idea but i am being dumb right now. Are they actual water balloons or regular balloons? Water balloons are very small and break easy. @Anonymous I'm not sure which type of balloon was used in this particular case, but I would def use regular balloons, not "water balloons." Just as you pointed out, water balloons you buy in toy stores or dollar stores would probably easily break. i tried it and it was an epic failure....I didn't fill them up much but the balloon itself became very fragile and began tearing away from the ice. turned into a big balloon mess in the cooler. @Anonymous: Sorry you didn't have luck with this idea. Did you use regular balloons or actual water balloons? Water balloons are definitely weaker. I would think you would blow up a "good" balloon a little add water, then put in the freezer on parchment paper or in a freezer bag to keep it from breaking. Good grief folks, it's not rocket science! Then why don't you post what you did step by step for those of us who are totally confused after reading all these posts. Great idea!! I am going to try but use light colored balloons and not tie them all the way but freeze open them after freezing and add those little glow sticks to them for a party we are having at night. So it adds a little light and is the cute balloon idea. Also I agree its not rocket science. Tried this last weekend and balloons did break after putting them out - but not really a problem as the round ice balls worked and looked cool, too.